There is nothing more satisfying to a gardener than seeing those first early spring flower bulbs popping up from the cold ground. These little sprouts soon bloom into gorgeous blossoms, brightening up your garden for the start of a great growing year. Let’s take a look at some common types of spring flowering bulbs. There are many types of spring flowering bulbs to choose from. Most people select some of each kind for a brilliant spring display. Tulip – These happy spring flowers are probably one of the more well-known spring bulbs. There are many variations and tons of colors to choose from. These bulbs prefer well drained or sandy soil that is rich in fertilizer. Plant tulips in the fall for spring blooms. Planting these spring bulbs is fairly easy. Place bulbs 4 to 8 inches deep and about 6 inches apart. In some areas, plants will come back year after year. In other areas, they will need to be replanted. Siberian Squill – These pretty deep blue flowers bloom on straight grass-like leaves and stems. They need to be planted in the fall for early spring blooms. They like well-drained soil in a sunny or partially sunny area. Plants can grow around 6 inches high and need to be planted around 6 inches apart and 4 inches deep. Daffodil – Daffodils are another spring favorite among gardeners with their beautiful yellow and white flowers. They like to grow in well-drained soil but it needs to be rich in compost or other organic matter. 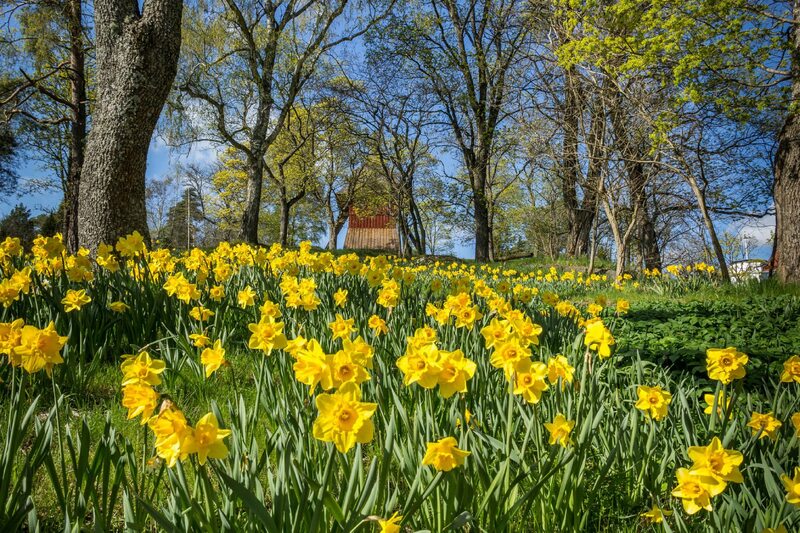 Daffodils do well in an area with full or partial sun. Their leaves are shiny, long stalks, and the flowers look like little cups. They should be planted 6 to 12 inches deep and 6 to 12 inches apart. Larger varieties will need more room. Divide every three or four years to keep these spring beauties from taking over. 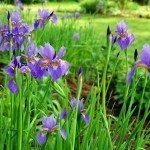 Dutch Iris – The Dutch iris is a beautiful dark purple iris variety that is a perfect cut flower. It can grow up to 2 feet high and needs to be divided after a few years to keep it under control. This kind of iris likes dry and sunny spots where it will receive full sun all day. Plant bulbs in the fall 5 inches deep and 6 inches apart. Common Snowdrop – These dainty little white flowers look like something straight out of a fairy tale. The blooms hang down in a dropping fashion. These bulbs do well in full or partial shade and moist soil. Plenty of compost is a must for beautiful blooms. Plant in the fall about 3 inches deep, and 3 inches apart. Crocus – These cute flowers are low to the ground and are perfect for garden borders. They grow about 6 inches high and bloom white, yellow, purple, or striped. They prefer well drained soil in partial shade or full sun. Plant in the fall for early spring blooms. Bulbs should be 3 inches deep and 4 inches apart.